This is a survey of primary sources for the history of the witch persecutions. Written late in the 19th Century, this collection doesn't attempt any analysis of the roots of the phenomena other than clerical abuse and mass insanity. Most importantly, these texts give insight into the cascading paranoia which characterizes witch hunts of any historical period. 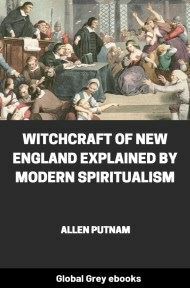 Perhaps no better statement of the theory of witch-persecution, as it came to be accepted in all lands and by all shades of faith throughout Christendom, can anywhere be found than that of the Rev. Cotton Mather in a sermon which did much to make that theory known and effective in New England. The sermon, preached in Boston in 1689, was speedily printed, under the title of A Discourse on Witchcraft, in Mather's Memorable Providences relating to Witchcraft and Possessions (Boston, 1689). This book, "recommended by the Ministers of Boston and Charleston," was in no small degree responsible for the great Salem persecution, which broke out in 1692. 1. THE NATURE AND REALITY OF WITCHCRAFT. 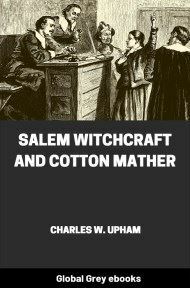 Cotton Mather: Memorable Providences relating to Witchcrafts and Possessions (Boston, 1689), pp. 4-9 of "A Discourse on Witchcraft." English. My Hearers will not expect from me an accurate Definition of the vile Thing; since the Grace of God has given me the Happiness to speak without Experience of it. But from Accounts both by Reading and Hearing I have learn'd to describe it so. WITCHCRAFT is the Doing of Strange (and for the most part Ill) Things by the help of evil Spirits, Covenanting with (and usually Representing of ) the woful children of men. This is the Diabolical Art that Witches are notorious for. First. Witches are the Doers of Strange Things. They cannot indeed perform any proper Miracles; those are things to be done only by the Favourites and Embassadours of the LORD. But Wonders are often produced by them, though chiefly such Wonders as the Apostle calls in 2. Thes. 2. 9.Lying wonders. There are wonderful Storms in the great World, and wonderful Wounds in the little World, often effected by these evil Causes. They do things which transcend the ordinary Course of Nature, and which puzzle the ordinary Sense of Mankind. Some strange things are done by them in a way of Real Production. They do really Torment, they do really Afflict those that their Spite shall extend unto. Other Strange Things are done by them in a way of Crafty Illusion. They do craftily make of the Air, the Figures and Colours of things that never can be truly created by them. All men might see, but, I believe, no man could feel, some of the Things which the Magicians of Egypt exhibited of old. Secondly. They are not only strange Things, but Ill Things, that Witches are the Doers of. In this regard also they are not the Authors of Miracles: those are things commonly done for the Good of Man, alwaies done for the Praise of God. But of these Hell-hounds it may in a special manner be said, as in Psal. 52, 3. Thou lovest evil more than good. For the most part they labour to robb Man of his Ease or his Wealth; they labour to wrong God of His Glory. There is Mention of Creatures that they call White Witches, which do only Good-Turns for their Neighbours. I suspect that there are none of that sort; but rather think, There is none that doeth good, no, not one. If they do good, it is only that they may do hurt. Thirdly. It is by virtue of evil Spirits that Witches do what they do. We read in Ephes. 2, 2. about the Prince of the power of the air. There is confined unto the Atmosphere of our Air a vast Power, or Army of Evil Spirits, under the Government of a Prince who employes them in a continual Opposition to the Designs of GOD: The Name of that Leviathan, who is the Grand-Seigniour of Hell, we find in the Scripture to be Belzebub. Under the Command of that mighty Tyrant, there are vast Legions & Myriads of Devils, whose Businesses & Accomplishments are not all the same. Every one has his Post, and his Work; and they are all glad of an opportunity to be mischievous in the World. These are they by whom Witches do exert their Devillish and malignant Rage upon their Neighbours: And especially Two Acts concur hereunto. The First is, Their Covenanting with the Witches. There is a most hellish League made between them, with various Rites and Ceremonies. The Witches promise to serve the Devils, and the Devils promise to help the witches; How? It is not convenient to be related. The Second is, their Representing of the Witches. And hereby indeed these are drawn into Snares and Cords of Death. The Devils, when they go upon the Errands of the Witches, do bear their Names; and hence do Harmes too come to be carried from the Devils to the Witches. We need not suppose such a wild thing as the Transforming of those Wretches into Bruits or Birds, as we too often do. It should next be proved THAT Witchcraft is. The Being of such a thing is denied by many that place a great part of their small wit in derideing the Stories that are told of it. Their chief Argument is, That they never saw any Witches, therefore there are none. Just as if you or I should say, We never met with any Robbers on the Road, therefore there never was any Padding there. Indeed the Devils are loath to have true Notions of Witches entertained with us. I have beheld them to put out the eyes of an enchaunted Child, when a Book that proves, There is Witchcraft, was laid before her. But there are especially Two Demonstrations that evince the Being of that Infernal mysterious thing.